We bid before our 4hr volunteer shift began. We again volunteered for our city's Community Radio station yesterday (18-Nov-18). We worked the phones for a band auction, a fundraising event for the station. Generous bands donate a show and folks can call in and bid. Does your city have a community radio station? Do you know the call letters? The frequency? I am not talking about public radio stations (which are groovy, don't get me wrong) but C-O-M-M-U-N-I-T-Y R-A-D-I-O stations. There's a difference, ya dig? KC's community radio station is almost 100% volunteer driven. Almost. With only 2.5 full-time equivalents (FTEs) as staff... most everything gets done at the radio station by volunteers... from programming on down the line. I have learned a lot about myself spending time there... about my personal strengths & weaknesses in self-directed community run/owned enterprises. And I have learned about some of the strengths & weaknesses of that approach to organizing effort (aspects & subsets of society). There is more to learn... real opportunities AND challenges to self-directed worker syndicate approaches exist... but I think it is a way forward. People use derogatory terms to describe such efforts and approaches. Before blindly embracing pejoratives I suggest first reading Le Guin or Vonnegut (and others) for fictional explorations of these concepts or read Kropotkin (and others) for epistemological explorations. Alternatives exist. See? Do you believe alternatives to the status quo are available? Are you searching, finding opportunities? Are you experimenting? I hope so. 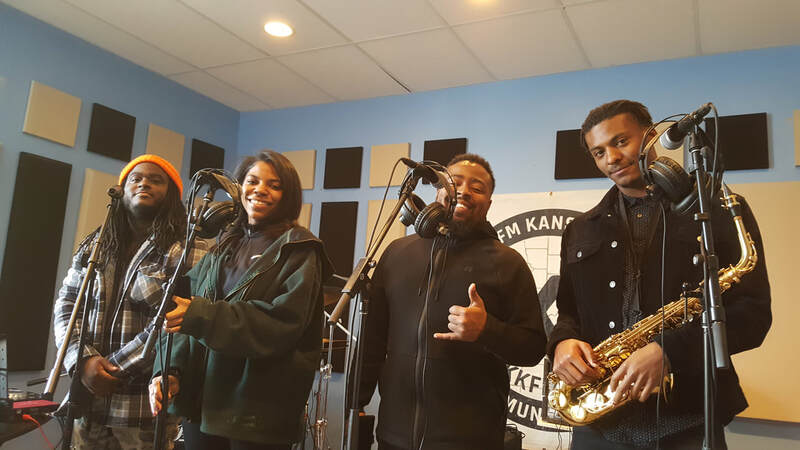 Photo: NuBlvckCity (New Black City) one of the many bands that donated a 2hr show to be bid on by KC Community Radio listeners.